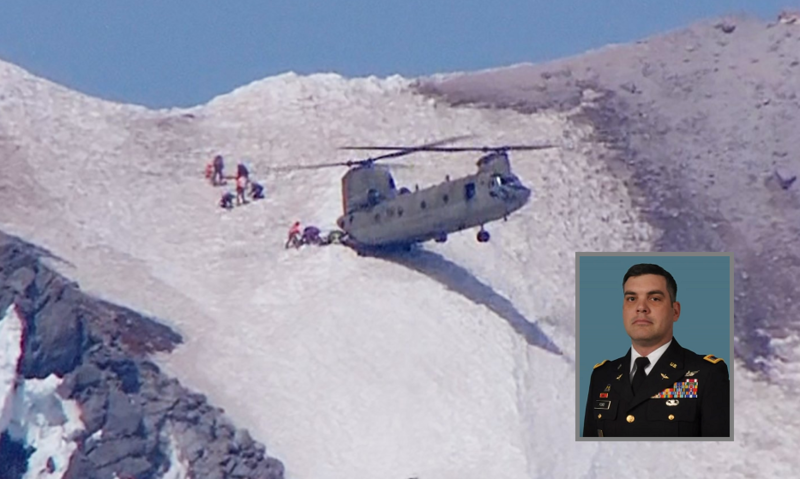 A climber from Texas who got into trouble climbing Mount Hood near Portland, Oregon, was skillfully rescued as Army National Guard CH-47 was called in to extract him and the rescue team he was with. The Chinook pilot was able to land the large helicopter with just two wheels in the snow, making for some fabulous footage. The large chopper was forced to perform what is known as a 'pinnacle landing' right on the slope of Mount Hood just below the top. The crew dropped the Chinook's ramp and balanced the helicopter on its rear wheels while those being rescued were able to climb aboard. The skilled helicopter pilots executed their task to perfection as it looks like the CH-47 is temporarily pinned immobile to the snow-covered slope. The ordeal began on Thursday with a call to police from a climber on the summit of Mount Hood who said he was going to take an overdose of medication. A search and rescue operation was sent under the command of the Oregon Air National Guard's storied 304th Rescue Squadron. The six-man rescue team found the individual but weather conditions made it unsafe to head back down. The Chinook was therefore called in. And they performed fantastically. Everyone could have ultimatly died if the crew wrecked…. But they friggn nailed it! Great job!